Scurrying down the sidewalk, my yoga mat bag bonk, bonk, bonks me in the hip as I trot. I’m late for yoga class as usual, and I groan when I see an ad for a local shop loitering in the gutter. “Sorry, I can’t pick you up,” I wheeze to the moldering litter. “I’ve GOT to make yoga class today, I’m under strict orders,” I explain. Passing over litter in the street pains me as much as reading a certain someone’s Twitter feed. I’m sorely tempted to pick up this wayward ad, as any “good” Earth lover should, all the while cursing the incessant onslaught of door hangers and discount cards. Not that I’m unsympathetic to the plight of local businesses. I owned a small shop in this very neighborhood, a few years ago. I recall the desperation to employ any means to get noticed—and keep the doors open for another day. But why, oh chicken plucking why, must our oceans suffer because of our well-meaning intentions? And don’t even get me started on the plastic debris in the gutter. That might send me straight to the medicinal Chardonnay. A couple of days ago, I found myself canvassing the neighborhood, ever lured by “just one more” leaflet—hours after I’d missed my regular vinayasa class. Yoga is one of my top Sanity-Saving practices, a go-to therapy when I cannot process any more bad news for the planet. My emotional well-being cannot skipping yoga class any more than I can risk an unlocked liquor cabinet. My yoga practice uprights me when the daily deluge of bad news for Earth sends me careening into eco-madness. That’s when I felt the urge to stop in the middle of the sidewalk to channel Bill Maher, which is odd even for me. Raising my clenched fist, I declared, “it’s time for New Rules! From now on, I will limit myself to picking up one piece of trash per outing.” Which sounded drastic, even as I said it. 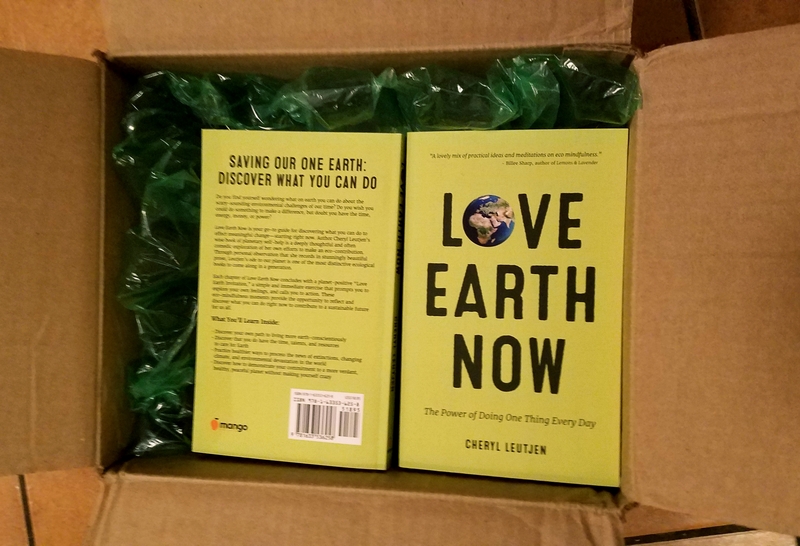 One act of demonstrating my love of Earth per day, I believe I wrote a book along those lines. Time for me to honor my own words. Picking up a single piece of litter reinforces my professed belief that “small things matter.” That’s the spiritual duct tape that’s holding me together, giving me the intestinal fortitude to face one more Tweetstorm attacking all that I hold dear. And holding myself together is essential if I aim to make any eco-contribution at all. I’ve gone the thumb-sucking and rocking in a corner route, and it didn’t make any positive change in the world at all (though it did get me out of cooking dinner). And doing what I can—what I have the time, the talents and the emotional bandwidth to do—that’s why I’m here. It’s why we’re all here. We each have our abilities to share and calls to action to honor. Mindful moments, be they in yoga class or a simple pause to reflect, can help reconnect us to the small, still voice within, the one that whispers the navigational guidance we need, to make our unique contribution. That’s what Earth asks of us, I believe. But then I also believe that sage brushes and pigeons communicate with me, so who’s to say? Only you can know. Start With Hello. . .